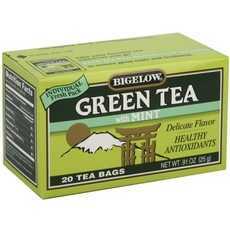 Enjoy Bigelow Green Tea with Mint (6x20 EA). The refreshing flavor of mint provides an invigorating taste to the delicate flavor of green tea that is uniquely different and delicious. (Note: description is informational only. Please read product label prior to use and consult your health professional with any question prior to use.